Well I did it. I opened up an online shop. I’ve been talking about doing this for the last year and I finally worked up the nerve to do it. Actually, I saw a video clip on Facebook of a graduation speech by Jim Carrey that really hit me. He said “…you can fail at what you don’t want, so you might as well take a chance on doing what you love.” Wow. That one minute clip really made me realize that I was letting fear hold me back. Now, I’m not sure that this shop will allow me to quit my job and finally stay at home with the kids, but it may allow me to work less out of the home and work at home doing what I love and spending more time with my boys. I’m happy to say that since I opened that little shop on Saturday and posted one little post on my Facebook that I have 2 sales already! I am blessed to have so many friends that shared my shop opening Facebook post! My next step is to create a Facebook page to link my blog and shop to and then to maintain this blog a little better. Hopefully in the next couple weeks I can upgrade my shop to hold 25 items as opposed to the 5 the free version allows. I already put a link to my shop in the sidebar on this here blog. Yay! I’m excited to see where this all takes me! 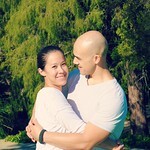 I really couldn’t do all this without the support of my amazing hubby. He really does encourage me to pursue my passion and gives me the time to nurture it. This was from yesterday before we went to finish Father’s Day off at Yogurtland. We actually ventured out and had a late lunch at The Standing Room in Hermosa Beach. That was our first trip to a restaurant since becoming a family of 5, and i’m thankful Finnley slept the whole time since Caleb and Gavin were a handful. 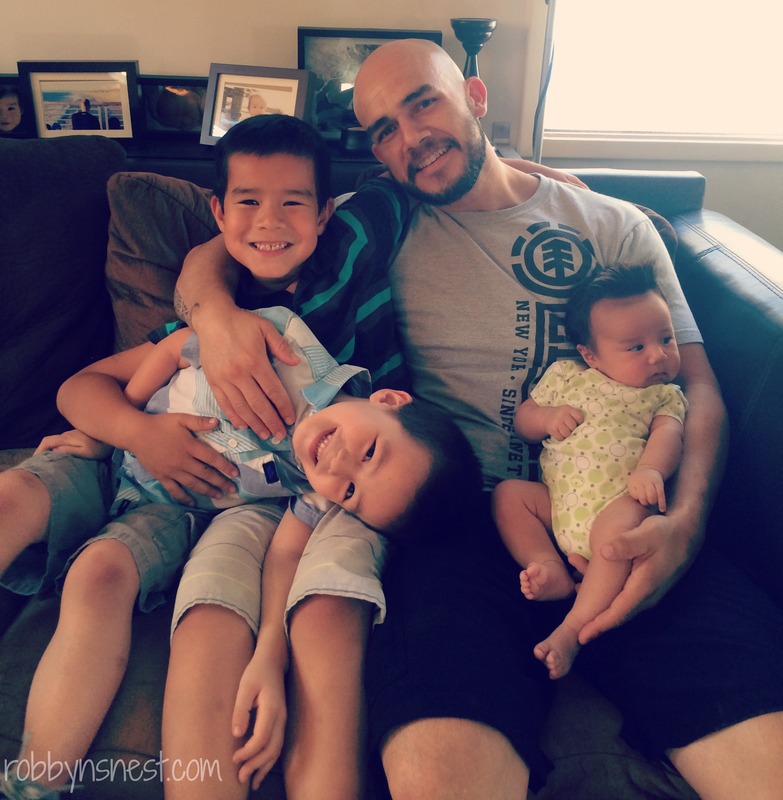 Poor Daddy wanted a little more relaxation time but life with a baby and two wild boys is anything but relaxing. 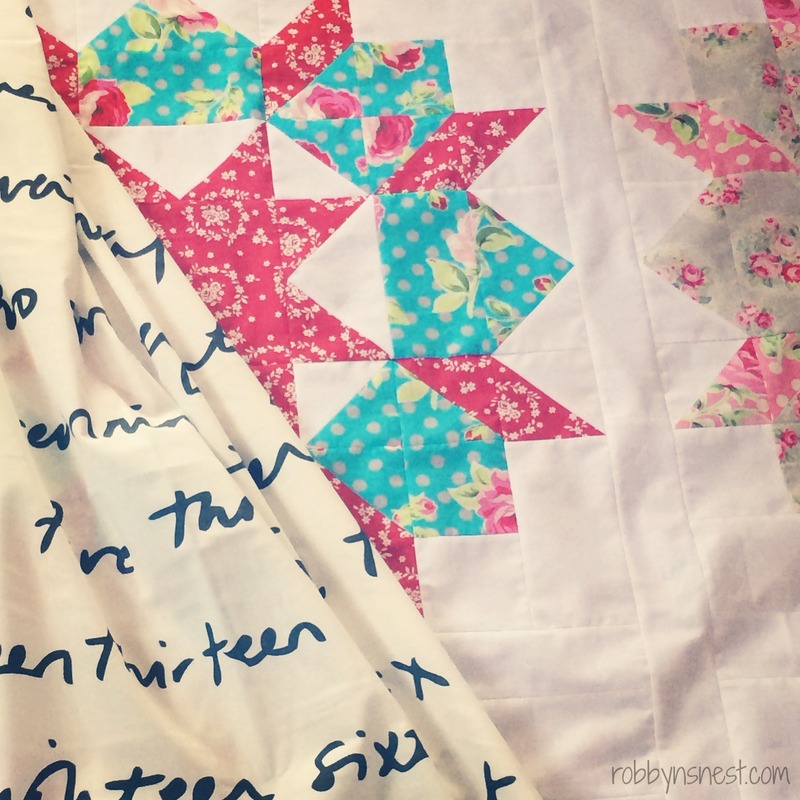 Aside from finally opening up a shop and the daily craziness of our household, I have been sewing up a storm! I finally finished my Swoon quilt top and pieced the backing last night. Here’s a teaser picture. 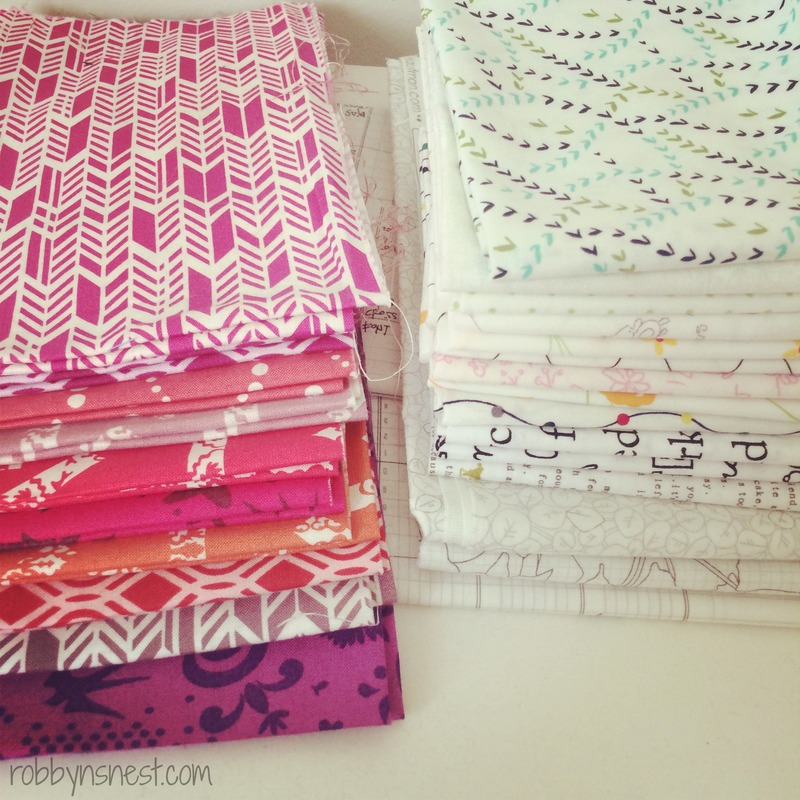 And in typical fashion I’ve already planned my next quilt and have my fabrics ready to go. I’m jumping on the low volume quilt wagon! The minute I saw the bundle on the left on Fabricworm I knew I wanted to make a low volume quilt with it. I can’t wait to cut into it! But first I need to finish up some clutches so I can list those in my shop! Hi there! I'm Robyn, a 30-something, wife, mother to 3 boys, sewer, and sometimes crafter. Another Finished Road Trip Case!